Being able to answer the question "how do I clean slate floors?" will help you keep your floors fresh and bright for years, ensuring that they look new no matter how much wear they take. The easiest way to clean slate floors is to be sure they don't get too dirty in the first place. Coating the floor with a high quality sealer (available from home improvement and flooring retailers) will keep liquids from penetrating the stone and give it a high gloss finish. For the best results, use multiple coats of sealer but allow each coat to dry for at least 30 minutes before applying the next layer. 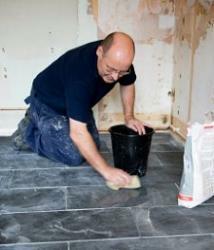 Do not use regular wax to coat a slate floor, as it will dull the stone and make it dangerously slippery. With use, the sealer will eventually wear out, and it should be replaced every few years, with the old coats stripped off before new sealer is applied.It is also easy to keep slate floors clean by using area and throw rugs in the areas most prone to spills and stains, such as near doorways and by kitchen appliances. Avoid wearing shoes on slate floors, as the shoes will drag in dirt, sand, and debris that will stain and scuff the floor. Wipe up any spills immediately to avoid lasting damage, and follow a regular cleaning and maintenance routine to keep your slate floors looking their best. So, How Do I Clean Slate Floors? Sweep the floor first to loosen any debris, or vacuum the floor with a soft bristle attachment or vacuum designed for stone floors. Dust mop the floor with a rag mop with cotton fibers. Sweep the mop in the same direction each time, moving slowly so no dust or dirt is scattered. Combine two gallons of warm water with 1/4 cup of mild soap (dish detergent or a slate floor cleaner) if desired; if your floor is not very dirty, plain water will be fine. Mop the floor slowly, wringing out the mop frequently to avoid spreading dirty water. If the floor is sudsy or soapy, rinse it with a clean mop and clean water. Allow the floor to air dry thoroughly before it is walked on. Most people will ask "how do I clean slate floors?" when they have a stain that needs removing. While slate flooring is naturally stain resistant, particularly if it has been sealed, it is always possible to stain the floor with certain foods, chemicals, or other products. In most cases, however, it is not the slate that will stain, but the grout between individual tiles. How you clean that grout depends on whether it is colored or non-colored. 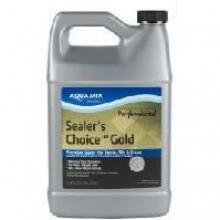 A sealer can keep floors cleaner. 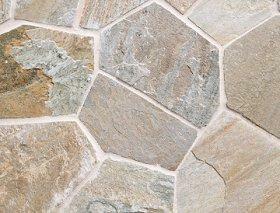 For colored grout, always test cleaners in an inconspicuous area before using them on the stain. Special cleaners that will not discolor or bleach the grout will be necessary to remove stains on colored grout. After cleaning grout, be sure to reseal the area of the floor that was cleaned to protect it against future spills or stains. Never use acidic cleaners such as vinegar, which can damage and discolor the stone. Avoid scrub brushes with stiff or metal bristles that may scratch the flooring. Use clean tools (mop, sponges, etc.) when cleaning the floor to avoid spreading extra dirt around. Sweep or dust mop your floor regularly as part of a house cleaning chore list to prevent buildup of debris or dirt that may cause stains. Cleaning will extend the life of slate floors, making them appear new longer and preventing damage and stains. By answering the question "how do I clean slate floors?" you'll be able to care for your flooring easily.